P22 Type Foundry creates computer typefaces inspired by art and history and is renowned for its work with museums and foundations to ensure the development of accurate historical typefaces that are fully relevant for today’s computer user. 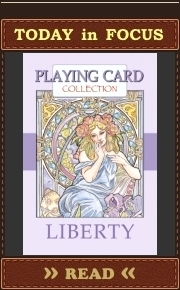 All cards should have different fonts involved (in spite of that the Costructivist font used twice). 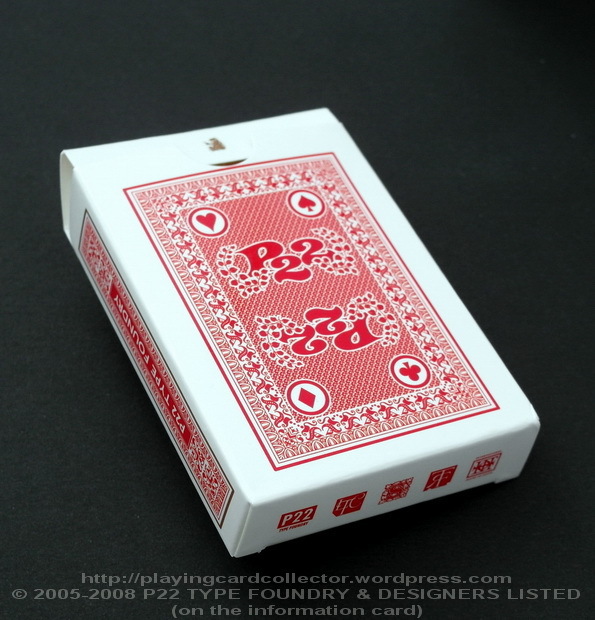 The deck: 52 playing cards + 3 different Jokers + information card + P22’s card-licence. 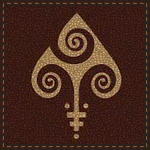 Poker size. 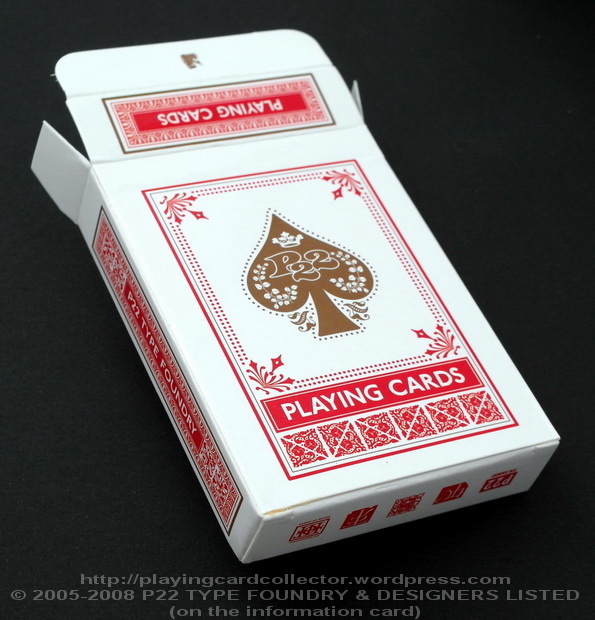 Playing cards are printed on casino cardboard with a glossy finish. The box has nice embellishments and a jocular frog 🙂 . 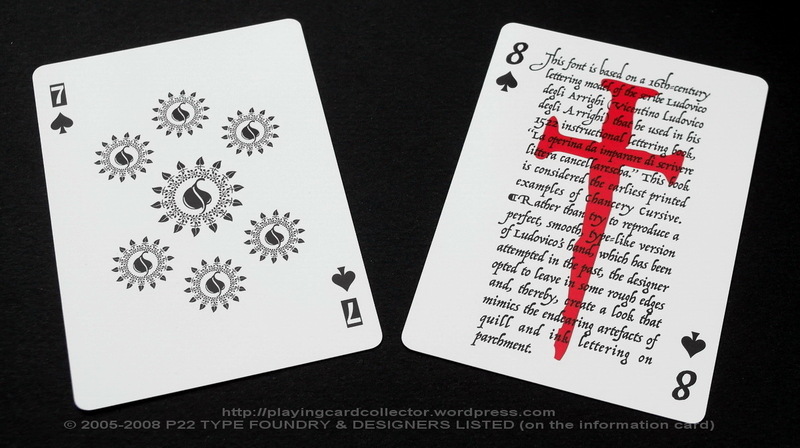 Five main folders of P22’s typographic materials are depicted on the bottom of the box as well as on one of three Jokers (see below). 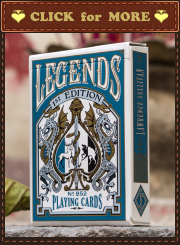 The back of the box has the design of cards backs. It is one way due to pips. See description in the first paragraph. 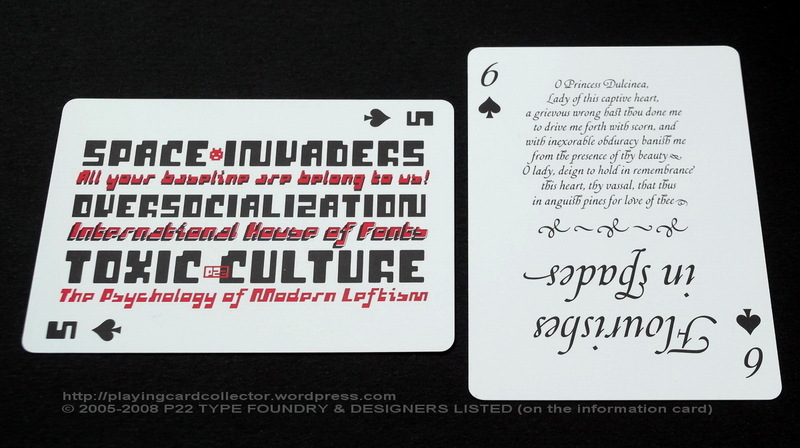 Type collections designed by different people. Lanston Type’s rich history dates back to 1887 when Tolbert Lanston received his first patent for a mechanical typesetting device. Later refinements led to the Monotype casting machine and the emergence of the Lanston Monotype Company as one of the most renowned type supply companies in the world. The Monotype caster was revolutionary and along with other automated typesetting machines helped to usher in a new age of printing technology. Typesetting had, until this time, remained the same as Gutenberg’s first hand-set movable type. In the late 1800s, Tolbert Lanston licensed his technology to an English sister company and became a major international force. After a series of other owners, the company found its way to master printer Gerald Giampa (one of the earliest developers of PostScript fonts), who moved it to Prince Edward Island in 1988. During its time of transition, Lanston continued supplying the American market for monotype hot metal type needs until January 21, 2000, when the majority of Lanston’s machinery and historical records were tragically destroyed by a tidal wave. In late 2004, Lanston has completed another journey back to the United States to come under the care of a new steward: P22 type foundry. No longer distributed by P22. Now distributed by Canadatype. Sherwood is a collection of 28 historically based fonts designed by Ted Staunton. All fonts contain a full international character set and most contain additional ligatures for more design flexibility. Each font page allows you to see a sample of the font or you may download a more detailed PDF specimen of the font(s).